NEW BEGINNINGS-IT TAKES COURAGE TO CHANGE ©: 1966? SOUNDS LIKE TODAY! I came across this newspaper article that led me to a website that houses famous speeches. I read this years ago, and it all still rings so true. It's as if Robert Kennedy spoke about today-2008. What do you see that still touches on the issues we are challenged with today? The main thing I see, is a larger lack of love. And more people with no real faith. Just words and show. May we all come to know One Love before our time is come. Please, take a little time and read through this, and I hope that the love that lived in Robert and JF Kennedy flows freely through the person God has Raised up to be in charge down here. For, NOW is always a good time! And God's Love NEVER FAILS! And he continued, "Beneath it all, he has tried to engender a social conscience. There were wrongs which needed attention. There were people who were poor and needed help. And we have a responsibility to them and to this country. Through no virtues and accomplishments of our own, we have been fortunate enough to be born in the United States under the most comfortable conditions. We, therefore, have a responsibility to others who are less well off." *The future does not belong to those who are content with today, apathetic toward common problems and their fellow man alike, timid and fearful in the face of new ideas and bold projects. Rather it will belong to those who can blend vision, reason and courage in a personal commitment to the ideals and great enterprises of American Society. * Our future may lie beyond our vision, but it is not completely beyond our control. It is the shaping impulse of America that neither fate nor nature nor the irresistible tides of history, but the work of our own hands, matched to reason and principle, that will determine our destiny. There is pride in that, even arrogance, but there is also experience and truth. In any event, it is the only way we can live." "Surely, we can learn, at least, to look at those around us as fellow men." We have yet to embrace the concept of being our brothers/sisters keeper. I'm hopeful. Thank you for sharing this important speech that was before my time but speaks directly to my time! you are so on point with your view of the speech/memorial that ted gave. one day i pray that everyone understands that you don't have to put others down in order to move upward! 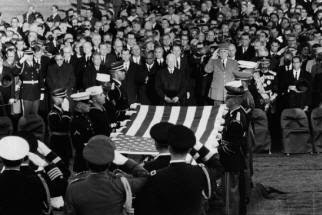 I remember where I was when I heard that President Kennedy had died...also the way it impacted me as an 11 yr old. 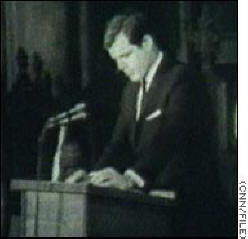 Later, in 1968 hearing that Dr. King was gone...next that Senator R. Kennedy, too, was gone. All this in the midst of turmoil unlike anything else to that point...until now. Although the stakes are higher, the lessons of 'being our brother/sister's keeper'...still seems a mystery to most. This, to me personally, is reprehensible. Each life touches every other life...whether for positive or negative. We also need to recognize that often big problems disguise big opportunities. Our hands CAN reach "across the aisle"...if we allow it. We can be agents of positive change. very truthful and engaged post. These are differing evils, but they are the common works of man. They reflect the imperfection of human justice, the inadequacy of human compassion, our lack of sensibility towards the suffering of our fellows. indeed. and it's almost as though we are being 'programmed' to continue down this road of human numbness. i too view such as common works. sometimes i sit and watch others as they interact, and i become amazed @ just how muh compassion is lacked. it's like no one even cares anymore. and whenever sometimes does care enough to actually take a true stand against such things. whenever someone stands up and speaks out against such backwardness, they are instantly murdered. But that is not the road history has marked out for us. we are in troule, aren't we?